PerceptIn, a leading visual intelligence company founded in 2016, is specialized in low-speed autonomous driving by developing robotic visual technology. PerceptIN’s core technology includes but not limited to vision-based sensor fusion, modular computing system design, and multi-camera calibration technology. The DragonFly Car developed by PerceptIn is the world’s ﬁrst aﬀordable, safe and reliable autonomous vehicle. It has been deployed by prominent international communication corporations and will be further adapted in various campus, industrial areas and other application scenarios. 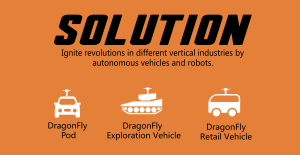 PerceptIN provides product, technology and solutions for autonomous vehicles. Building autonomous vehicles is not that much different from building LEGOs. They have simplified autonomous vehicle designs and modularized the components. Developers can now simply integrate components to build their own autonomous vehicles.